ALICE Named a "2018 Best Place to Work in Hotel Tech"
ALICE is excited to share it has been named a ‘2018 Best Place to Work in Hotel Tech’ by HotelTechReport for creating and maintaining a culture that fosters employee satisfaction along with business growth. HTR surveys thousands of hotel tech employees around the world about what it’s like inside the operations of the industry’s greatest technology companies. Being on this list is truly and honor and a testament to our commitment to our people. Like the industry we serve, hospitality is one of our core values. We continually aim to anticipate needs, build empathy, be generous, and most of all, be genuine. We believe it’s important to act with integrity and to build relationships with the people around us. It all starts with our team. 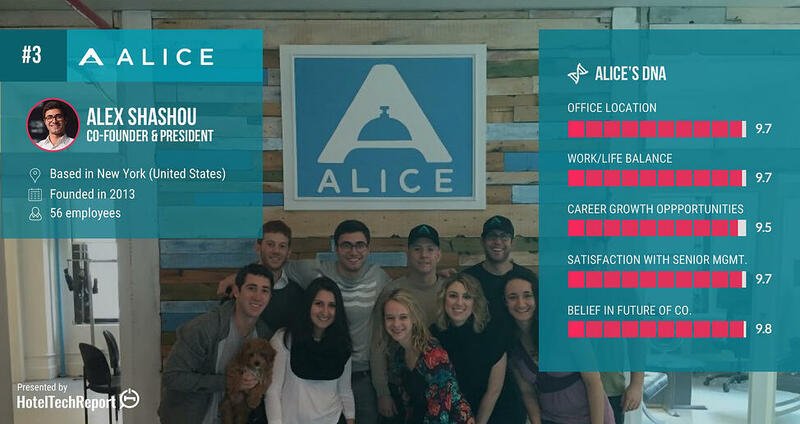 ALICE has grown from 3 humble founders to a global team of 80+, since its inception in 2013. Our workforce has hubs in NYC, Los Angeles, Latin America, Europe, Eastern Europe, Asia Pacific, and beyond. A goal of 100+ employees in 2018 requires special people to come aboard and contribute. We encourage you to reach out to our People team via the Careers webpage, directly via people@alice-app.com or by visiting HotelTechReport, Linkedin and Glassdoor to learn more about how you fit into our growth plan and apply. Every role is critical to ALICE’s success. We hope you find your contribution and opportunities for personal and professional growth equally rewarding!